Simply 7: First Day of School!!! I always hate the first day of school. I feel so bad for the kids. (Summer is over) But by the 2nd day I'm thankful it has started. Its nice to have some sort of a schedule. 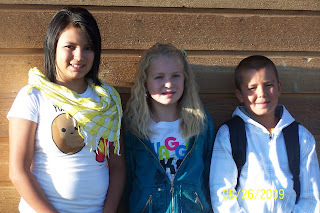 Lakynn is in 8th, Tatum is in 6th, and Dakota is in 4th grade. Kiowa is headed off to preschool tomorrow. Peace and quite for a few hour out of the day will be so nice. Dakota has his first football game tonight. Way excited to watch him hit some kids hard! Lakynn has her first volleyball game tomorrow night. GO LOU! Tatum, well I need to find her a dance class. They are very limited in our valley or I should say a good one is very rare. The little boys just hang with me and are very good supporters of their siblings activities.